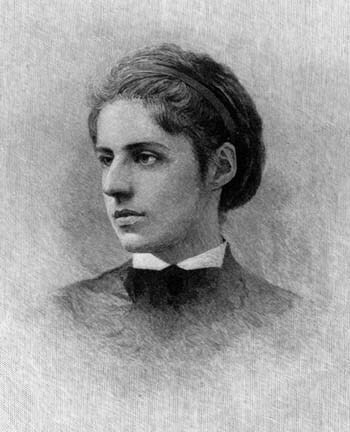 Emma Lazarus (1849 - 1887) was an American poet and immigration advocate who spoke many languages and began studying literature at an early age. She started writing about her Jewish heritage after reading George Eliot's work. Ralph Waldo Emerson followed her writings. When anti-semitic violence erupted in Russia in the 1880's, many Jews immigrated to New York City seeking safety and new opportunity. Lazarus began writing pieces to champion the causes of indigent Jewish immigrants, in particular. You'll recognize her famous sonnet published in 1883, not necessarily by its title, The New Collosus, but by its welcoming lines inscribed on the base of the Statue of Liberty: "Give me your tired, your poor, Your huddled masses yearning to breathe free."